I often find it difficult to decide whether a drawing should be left alone as a simple drawing or to go further and add watercolor to it. I really like them both ways. There are times when a drawing just seems incomplete without the addition of color. Other times, a drawing is “finished” in and of itself. 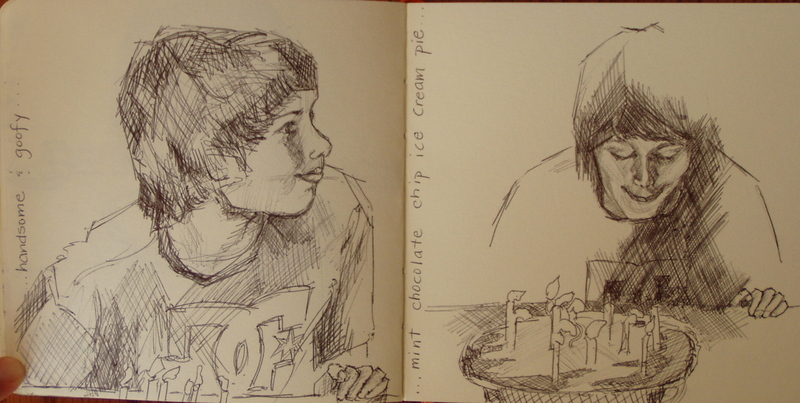 With these drawings made of my son from photos of his 12th birthday, I thought about this over several days and decided to photograph them “avant le couleur” and “apres le couleur”. Which do you prefer? I like them both for different reasons, but I’d love to hear what you think. I like them coloured – adds to the ‘party’ feel. I especially like the one on the bottom right – has a bit of an air of mystery too. I really love the uncoloured versions as they are outstanding. BUt I agree with Winna and Margaret – the bottom right coloured version has such a lovely glow to it and captures the moment of blowing out the candles. I have had the same issue recently and ended up leaving the original and photocopying it on a thicker card and painting on that. I just didn’t want to ruin the pencil sketch I was so proud of. I like them both, however, I am more partial to the B/W drawings. I think less is often more with drawings. Of course there are many exceptions. Excellent work! These are lovely portraits. I’m undecided. I agree with Margaret, the colour gives a real party atmosphere, but I think, personally, I prefer the black ink. Either way, these are really very lovely portraits. The unpainted ones are the best. I think the colored ones take away from your fine work. Thanks Donn for your comment…I swing back & forth from loving the strength of line alone, to the fun of colors. I enjoyed visiting your flickr site, but was unsure of how to leave a comment. I especially liked your b & w work also! The tree stump, the b & w acrylic or oil of a boat on the water, and the wonderful old-timey bicycle were favs. Thanks again for visiting! I like the ones with the colors, especially the top right. I love how the color makes the expression in the boy’s face pop out. I prefer the ink drawings too. The colored version has good points, but your work is beautiful without it. Great work. I like the simplicity of the uncolored versions, and the way the faces, especially the eyes, stand out in these. Just my taste, but the colors on all but the upper left one are a little too busy and muddy for me. The strength of your talent shows brightly, even without the added brightness of color! I don’t like black and white, except on zebras and newspapers… LOL I totally prefer the colored versions here. I believe the answer to your question lives inside of you and you alone.Creativity and art are not the same without the perspective of the artist.As for what I think or feel differ from one to the other, but all good.So I think the true question is what do you think? Thank you Ashley for your great words…my opinion is that I like them both for different reasons: I love the strength of line alone and that B & W often “suggests” color to the viewer. But I enjoy the colored ones for making them more painterly while using the drawing as a sort of framework for color to hang on. I have actually been tickled to hear from some that they think my drawings, just as they are, are strong. You are right, the true question, and the only one that matters is what I think. It has been fun to pose the question to others. Thanks again for the comment. I agree with Winna that I like the top two uncolored, and the bottom two colored. I love pen and ink drawings, and all the hatching, etc – it’s like acoustic music. The color is like, well, electric. There’s a place for both. I read a recommendation in one art book I have that when watercolor is to be applied, use less detail in the ink drawing. Makes sense to me, but I am trying to find the proper balance. Interesting (and enjoyable) post. I think they both have their appeal. I always always prefer color – I like how you apply color very much especially the Caran d’Ache Neocolor II crayons. Bright color – gotta have it.